I don’t know about you but I really struggle to eat enough fruits and vegetables at this time of year. At least in raw form. When the weather cools my body wants warm, heartier foods; raw fruits and vegetables are too cold. In Chinese medicine and acupuncture practice they would guide that in the cold months eating warming foods is the best for your energy system, as are cold foods in the hot months. I guess that validates me as normal but doesn’t fulfill the daily suggested servings of fruits and vegetables. When the calendar clicks over to January everyone jumps on the healthy eating band wagon. 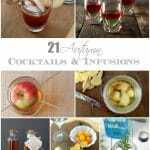 Leaving the over indulgences behind from the holiday frolicking in December, healthy options and smoothies grace the cyber waves in full force. Last week on Thanksgiving morning I was craving a smoothie like nobody’s business. Like being desperate for water on a searing hot summer day, I needed fruits and vegetables. I try to heed those physical signs, clearly signaling I’m not getting enough. I think the secret of making satisfying smoothies in the winter are the ingredients. I like having all the ingredients room temperature so it is not too cold. 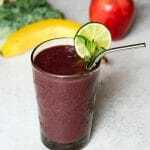 I usually only use filtered water in my smoothies, liking to keep the extra calories out of the equation by adding juice or higher protein options. In this case I used all the wonderful seasonal fruits we are enjoying right now: fresh cranberries, pear, apple and orange. To warm it up I added fresh ginger root which brings a beautiful flavor to the smoothie and really does produce a warming effect. To counteract the tartness of the fresh cranberries there are a few pitted dates as well adding some sweetness. I truly believe this may be my favorite smoothie I’ve ever made! Perfect for the winter months. 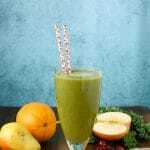 This healthy, delicious smoothie is packed with nutrition and antioxidants while still being lusciously rich. 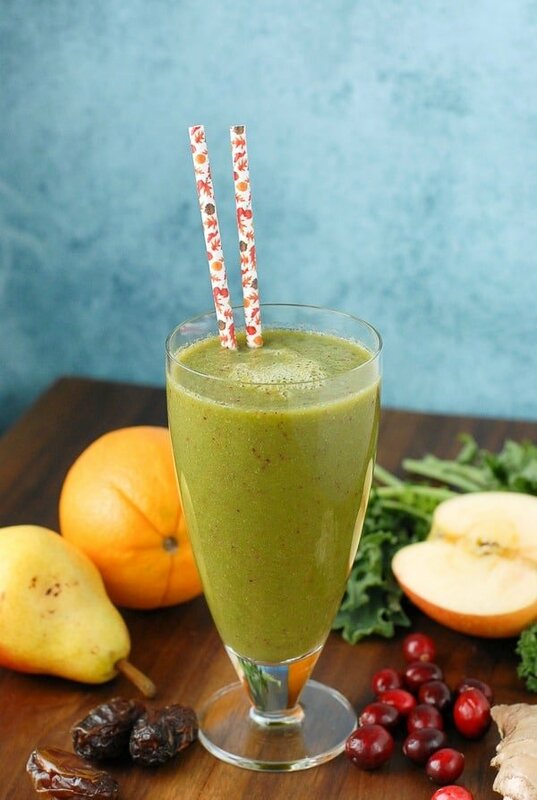 It features seasonal fruits in pear, cranberries, apple and orange along with kale, ginger and some dates to sweeten it up naturally. 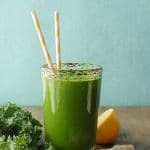 Only mixed with filtered water the flavors and calories are from the fruits themselves.Prepare the fruits and kale in the dice size that works best for your personal blender. Add all ingredients to a blender and blend until all ingredients are pureed and smooth. 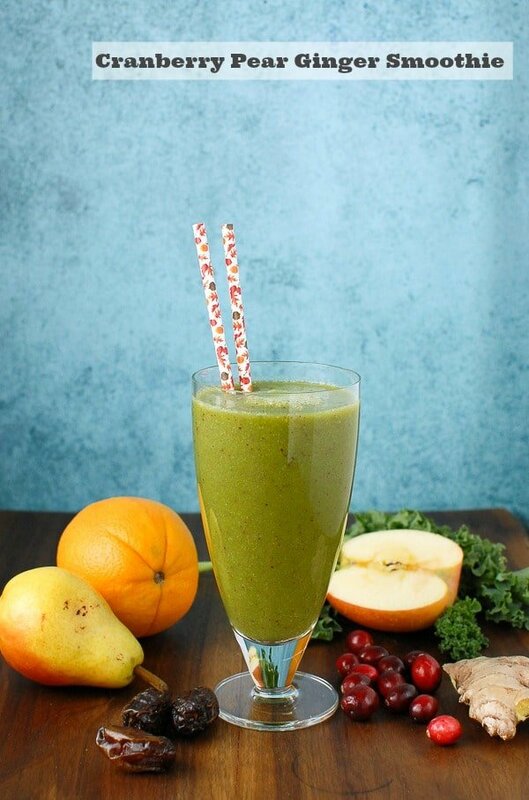 This looks great…both delicious and healthy! Love the dates in there…something I haven’t done before…thanks for sharing! Now that’s a tasty way to get your fruits and vegetables! There was so much eating last week that I’ve been trying to be a bit better about things this week. Lighter meals, no drinking (it’s been hard). A smoothie would probably be a good idea right now. Maybe after I hit the elliptical (also a challenge). 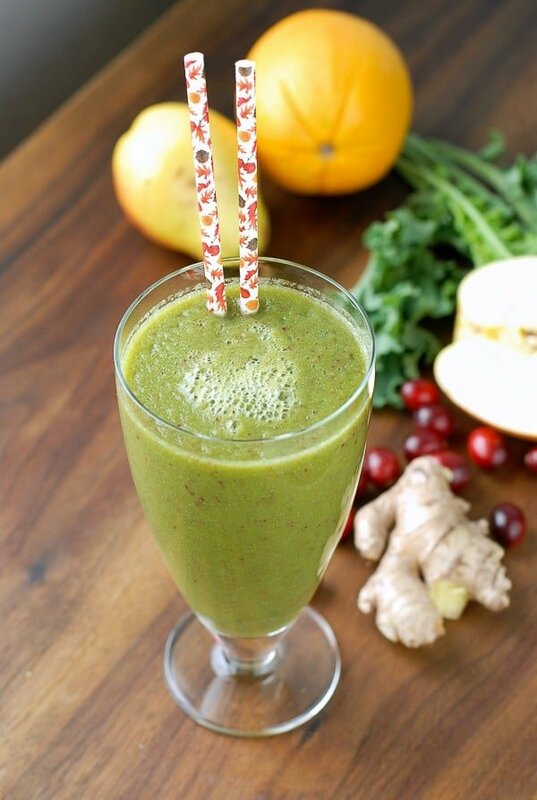 With all the overindulging we’re doing at parties, it’s nice to take a break and have a super healthy smoothie. It’s a great way to use some leftover fruits and dates from holiday recipes, too!